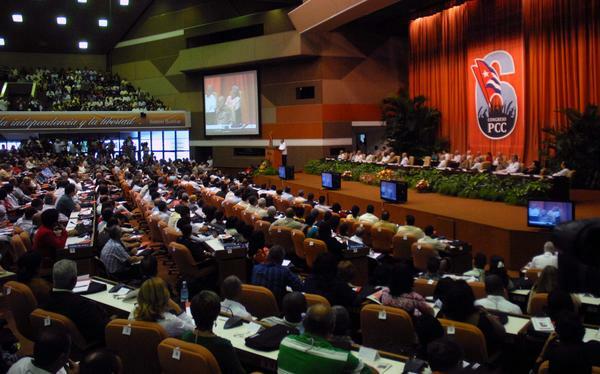 | The Cuban Communist Party, enemy or adversary? Many things have changed in Cuba and the world since the 1st of January, 1959, the date in which our country began to be submerged in a spiral that seemed to drag it into an endless abyss. But now, being cautiously optimistic, it seems that a light of hope has started to bright, telling us that it has reached the bottom and that we can start to think that slowly, step by step, we can start to attain levels of freedom and well-being that has been deprived from us for decades. Reason is on our side. Now the initiative is ours and every day will be stronger; they are the ones in downturn. And, right now, it is when we must take a break, without stopping our struggle, to analyze, to plan, to choose the best roadmap to achieve our goal: To bring freedom and democracy to Cuba. And one of the many questions on which we have to think and bring a right answer is: Is the Cuban Communist Party (CCP) our enemy or our adversary? The CCP is not Raul or Fidel Castro. They are only those who have seized the leadership of both, the party and the nation. The CCP consists of thousands of Cubans like us, among which there are opportunists, racketeers, demagogues, etc. ; and make no mistake, any of them can be found in our way trying to jump in our train. But there are also Cubans who were honestly betrayed; that realize that there is a need to change. There are Cubans who has been fooled but who see the party as the only way available. We have to make them realize that the party is nothing more than a form of organization and that there are many other alternatives. There are Cubans who sincerely believe that communism is the salvation of mankind, who should get the message that communism in the XXI century is not like the communism that the Castros maintain in Cuba and that there are many other models in Europe and other places where they have reinvented themselves, changed their strategies, rejected the dictatorship of the proletariat and accepted the “challenge of the voting polls”, and even abandon the appellative of “communist” or “Marxist”. We have to work together with them to find solutions, not only to the problem of bringing a plate of rice for today’s lunch which has to be done because is an immediate need, but to solve the root cause of the problem and this is to have a job that provides a fair wage that is enough to make a living without having to steal from the state. Then, he or she can go to the grocery to buy rice, beans, avocados and coffee anytime he needs and then come back to his home, where there is enough running water, electricity and a kitchen equipped with everything necessary for cooking. How? Do you think that this work cannot be done? Do you think that you cannot speak with a communist? I think you would have no objection to talk, God permitting, with Fidelcio Ramel, one of the victims in the ”March 13th shuttle”, sunk by the Cuban coast guard when they were trying to escape to Miami seeking a better horizon for him and his family. For sure you won’t be in a disadvantage? Then, why do you refuse to talk to Fidelcio Ramel, a member of the Cuban Communist Party? Both were the same person, the same person just trying to protect his family, and his great Cuban family, and keep them away from all scarcities. It is not to fight with them, they are also Cubans. It is talking to them exactly for that reason: because they are Cubans. It is to try to make them reflect in a democratic way. It is clear that we will not find a 100% identification to solve the problems. But we should not look at the differences, we should look to those things that we have in common. Even if it is only a 1%, let’s work together and the percentage will grow. We all have a lot to do to rebuild Cuba and Cuba cannot afford to overlook any of his sons to be rebuilt. We do not seek confrontation, we seek to speak, dialogue. We just want that: talk and dialogue. The rest will come later. From that dialogue will emerge the new Cuba that all Cubans want, where all of us will find our place, the communists and those who think differently. This place will be bigger or smaller, but it will not be determined by the interests of an oligarchy or by a few fetid leaders. It will be decided by the free vote of all Cubans, who as a whole, will decide who will represented them in the Congress, in what proportion, what ideologies will be represented and, of course, who will lead our government. At that point they and us will see that today, in 2015, it is possible to speak and overcome differences, so that in a new Cuba, we will be just adversaries, allowing us to pacifically devote to study and work for ourselves and our families and, of course, by and for the reconstruction of Cuba.